Don your virtual suit of armour and get ready to joust in Medieval Money, a middle ages themed video slot powered by IGT. This 5 reel, 20 payline game comes with pick me, cash trail, spell picker and free spins bonus features which give plenty of chances to win. Play from between 20p and £80 per spin. A medieval tournament is the setting for this nicely designed game – set against an imposing castle, the reels include a big-nosed knight, a blonde princess and the queen and king alongside the usual lower value playing cards. They’re drawn cartoon style and are very easy on the eye. The most rewarding standard symbol is the MM logo which will get you a 1,000 coin payout if you land 5 on a payline. The jester’s hat is the game’s wild, replacing all other symbols bar the bonus inducing scatter – it can only land on the middle 3 reels. Money Bag’s Picker feature – this is a classic pick me round. Choose 1 of the 33 bags of money to reveal a cash prize of anywhere between 2 and 50 times your total bet. Joust Free Spins Bonus feature – 7 free spins are awarded if you land this. Hope to land a pair of wilds during this feature as the 2 knights will go on and joust. If the blue knight wins, all blue symbols between the 2 helmets will turn wild. If red wins, it’s the red symbols that turn wild. Spell Picker feature – a Merlin-style magician will give you the pick of 5 magic potions. Choose 1 to reveal a multiplier prize of 5x, 7x, 8x, 10x, 12x, 15x, 20x, 25x, 40x, 50x or 100x. If you don’t like what you’ve picked, you can reject it and choose again. A total of 5 picks are possible here. Dragon Path Bonus feature – this is a cash trail bonus. The further along the trail you make it, the bigger the potential rewards. Make it all the way to the end and you’ll reach dragon’s hoard where prizes of 200 times your stake are on offer. 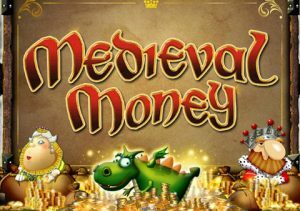 Medieval Money is an entertaining romp through the middle ages – it’s well designed and comes with some cracking Greensleeves-style soundtracks that certainly enhance the historical theme. The features aren’t too shabby either, offering plenty of variety as well as winning opportunities. We’d put the variance in the medium to high range. You won’t win too often but when you do, Medieval Money can deliver riches worthy of a king. If you like the theme, you have to play Black Knight II from WMS Gaming which is a volatile classic and one of my favourites.